Can’t Immigrants Get Citizenship Through Marriage? AUSTIN — The removal from the country of Alejandra Juarez — the wife of a Marine veteran — last week prompted more than a few people to ask, why didn’t Juarez, who was undocumented, become a citizen? “… I must ask, if her husband was a naturalized US Citizen, she could have received a green card by marriage, why did she not do it in 20 years?” Susana Hite asked in a tweet. I am opposed to family separations, but I must ask, if her husband was a naturalized US Citizen, she could have received a green card by marriage, why did she not do it in 20 years? 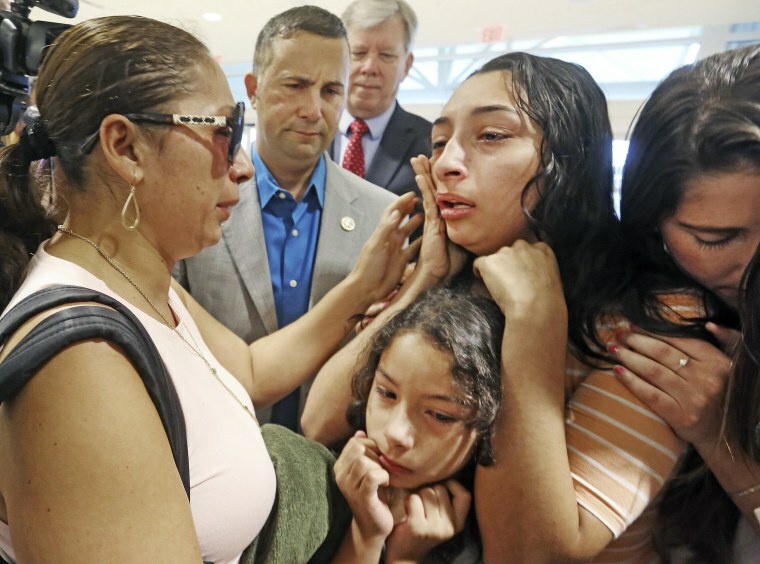 Chelsea Nowel, a Tampa, Florida immigration attorney who represented Juarez, said the puzzlement doesn’t surprise her. “I’ve had to explain it to my own family and friends. It’s a commonly misunderstood process,” Nowel said. Generally, marriage is a route to eligibility for legal residency — getting a green card — and then, citizenship if the couple satisfies immigration officials that the marriage is not a sham to get legal status. For example, someone may be in this country on a student or work visa, fall in love and decide to get married or a couple may meet while the citizen is traveling or working abroad. Although the process is complex, a foreigner who marries a U.S. citizen is eligible to become a legal resident and can apply to do so from within the country. Once the spouse of a U.S. citizen is a legal resident, they only have to wait three years to be eligible to apply for American citizenship, rather than the usual five. In the 2016 fiscal year, 304,358 spouses of U.S. citizens “naturalized” to become citizens, according to the most recent Department of Homeland Security data. But for spouses of U.S. citizens who came to the country illegally, been previously deported or have other violations in their background, becoming a legal resident is a lot harder — and in some cases impossible — because of a 1996 immigration enforcement law and the Trump “zero tolerance” immigration enforcement policy. “We got into this mess because of the 1996 law. Before, someone like (Juarez) would have gone before an immigration judge who would have weighed the nature of her offense against the rights of a U.S. citizen spouse,” said Donnelly, strategist for American Families United, a group formed to advocate for U.S. citizen spouses of immigrants who are foreign-born. The 1996 Illegal Immigration Reform and Responsibility Act, signed by then-President Bill Clinton was a sweeping package of hard-line enforcement measures. It made legal residents deportable for criminal convictions and notably sped up deportations by essentially erasing the chances for immigrants to go before a judge if they were arrested up to 100 miles from the border. The 1996 law also created a banishment system for people who have lived in the country illegally. Those in the U.S. unlawfully for more than 180 days and less than a year are blocked from trying to re-enter the country legally for three years. Those in the U.S. unlawfully for more than a year are blocked from returning for 10 years. Unlike those who entered legally, those who did not must leave the country to apply for a visa. But the 1996 law makes it impossible for an American citizen’s spouse who is illegally in the U.S. from leaving to apply for a legal residency visa because once the spouse leaves, the spouse can’t come back for three or 10 years. The 1996 law also expanded a list of “ineligibilities” — reasons people would be ineligible for visas to the United States, including legal residency visas or green cards. The list includes anything from having a communicable disease to lying about being a citizen, to being ordered removed upon arrival, to coming from a country that is a state sponsor of terrorism. Some violations such as falsely claiming to be an American citizen get people banned for life. Juarez is one of those people. She was removed from the country last week after living 20 years in the U.S. Her case became the focus of national publicity because she is married to a Marine infantryman who served in Albania, the Congo and South America and who also served in Iraq with the Florida National Guard. Juarez had tried to enter the U.S. in 1998 from Mexico when she was 18 — she has said she was escaping violence in her home country — by presenting herself to immigration officials and claiming to be a citizen. Her attorney said she immediately retracted the statement. She was removed from the country under the speedy deportation process put in place by the 1996 law. ICE’s account on another attempt, in which the agency said she claimed to be a citizen, conflicts with an account by Juarez’s attorney. Sometime later, Juarez made it across the border illegally and remained in the U.S. for 20 years, during which she married and had two daughters. She was stopped in 2013 for a traffic violation, which turned up her 1998 removal order. Juarez had been able to stay in the country even after the prior removal was discovered because of Obama administration policies that made immigrants who had committed crimes or public and homeland security threats the priority for deportation. In the case of Juarez, she was checking with immigration officials on regular basis, who told her she wasn’t a priority. But the Trump administration has done away with that priority system. Immigration law provides exceptions for people who have been banned from the country. They can ask for a waiver from the 3-year or 10-year bans. But to get that waiver they have to show that being separated from a spouse or children would cause extreme hardship. Under the Trump administration, extreme hardship is a harder threshold to meet. “Trump changed the definition of extreme hardship to make it more restrictive,” said Peter Boogaard, a former Department of Homeland Security spokesman in the Obama administration and a spokesman for FWD.US, an advocacy group based in the technology community that pushed for a reprieve for Juarez. Juarez’s false claims that she was a U.S. citizen make getting a waiver that much harder. The State Department keeps track of the number of people deemed ineligible for visas, reasons they were refused a visa and how many overcame the ineligibility. In 2016, no immigrants who had falsely claimed to be a U.S. citizen had been granted visas, according to the data. However, 981 non-immigrants — people who come to the U.S. for short periods, for reasons such as tourism — who had falsely claimed to be U.S. citizens were granted waivers. The Obama administration created a “parole in place” system for military spouses such as Juarez, who are in the U.S. illegally, to apply for legal residency without leaving the country, so they are not kept from returning. But parole in place is done on a case-by-case basis and Juarez was denied several times. The numbers of military applications for parole in place requests have been steadily increasing, rising from 3 approvals out of 18 requests in the year the Obama administration began the program, to 6,595 requests with 4,800 approvals in FY2017, according to data from Citizenship and Immigration Services, part of the Department of Homeland Security. But the share of approved applications dropped from 81 percent (4,058 approvals of 5,018 requests) during FY2016, the last full fiscal year during the Obama administration, to 73 percent (4,800 approvals of 6,595 requests) in FY2017, nine months of which was during President Donald Trump’s administration. The number of denials has increased, too, but the share of denials is about the same. Not all cases are adjudicated in the same year they are received. The advocacy group American Families United has been pushing for years for changes in the law to allow couples with an undocumented spouse to remain together. The group also maintains that it should consider the rights of the U.S. citizen who is being deprived of a spouse.